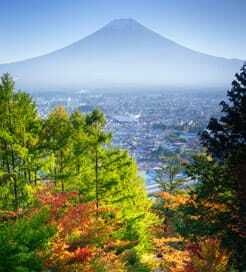 Japan is actually an archipelago of nearly seven thousand islands, the largest being Honshu, Hokkaido, Kyushu and Shikoku, which are then divided into forty seven prefectures. With an ancient culture as well-kept as its high-tech metropolises, Japan is a multi-layered country, filled with beautiful surprises and juxtapositions around every corner and each island serving up something different. The wild north, Hokkaido, encompasses twenty percent of Japan’s land area; but only five percent of the nation’s population calls it home. Made up almost entirely of beautiful, natural scenery, it offers year-round fun outdoors. Hikers and cyclists make the journey here in summer for the tapestry of glistening crater lakes, brightly coloured flowers and rolling fields. When winter comes around, so does world-class skiing, and the numerous geothermal hot springs, known as onsen, become even more inviting. Honshu is the main island, divided into various smaller regions due to its enormity. Featuring some of Japan’s most recognisable attractions, it’s the most visited island, too. On the east coast lies the capital, Tokyo, an ultra-modern city and financial hub, holding a reasonably firm grip on its traditional past. Wooden shanty bars and shops selling centuries-old style jewellery are usually found beside immense skyscrapers and tech stores. The iconic Mount Fuji looms in the distance, with cherry blossom-covered temples, majestic castles and stunningly-preserved geisha tearooms surrounding its foothills. Encircled by the country’s most famous pilgrimage route, Shikoku is the smallest main island. The holy journey stretches twelve hundred kilometres, taking you past eighty eight Buddhist temples, built in honour of the ninth century monk Kukai. It is, therefore, a place for pursuing spiritual perfection, or nirvana. Its rural beauty contains one of the earliest known hot-spring spas in the country, as well as cascading hillside rivers offering excellent white water rapids. Finally, furthest south, Kyushu has a more sub-tropical climate, which, as a result, culminates in popular beaches, unbeatable surfing and scenic hiking trails during the summer months. Scattered with active volcanoes, Kyushu’s Mount Aso is one of the world’s largest, while the city of Nagasaki features many though-provoking commemorations to the 1945 atomic bombing. As a nation incorporating thousands of islands, the Japanese ferry industry is thriving, with market leaders operating top-of-the-range fleets and extensive timetables. The majority of ferry routes interlink the Japanese islands, including the tropical Yaeyamas, close to Taiwan, but international crossings are available from South Korea and China. For more information, please visit our Ferries from Yakushima to Japan page. For more information, please visit our Ferries from South Korea to Japan page. For more information, please visit our Ferries from Izu Islands to Japan page. For more information, please visit our Ferries from Tanegashima to Japan page. For more information, please visit our Ferries from Sado Island to Japan page. For more information, please visit our Ferries from Hokkaido to Japan page. For more information, please visit our Ferries from China to Japan page. For more information, please visit our Ferries from Russia to Japan page.